Summer Camp sessions will be held June 10 – August 16. Click here for complete details including registration information. Registration for our ever-popular Summer Camp program at the Center at Fairfield is now open. Camp will be held through August 16, 2019. 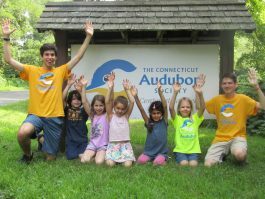 Connecticut Audubon Society’s Summer Camps are staffed by experienced teacher-naturalists from CAS Centers and college-educated men and women who have experience working with children. Our Summer Camp staff is First Aid, CPR, & Epi-Pen trained. Low staff-to-camper ratios ensure all campers have a safe, fun and educational camp experience. Our Summer Camp staff strive to provide a variety of hands-on activities each day. Camps fill quickly…download our brochure today so you can choose your camp sessions and register.